Geekily, I have been waiting for the Twins to put the tickets onsale for the June tours. Finally, they went on sale, and they arrived on Friday. With the tickets (different stock than our game tickets! ), we received a pocket schedule and a transportation flier. 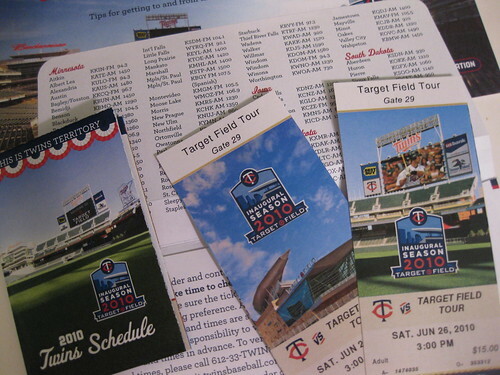 I also appreciated that the ticket envelope lists the national radio affiliates where you can hear the Twins. Just small, lovely, little touches, which I appreciate, since large market teams don’t have to do these things – so they don’t.